Natural soap bases with added essential oils and extra moisturizers . Each bar is handcrafted to enhance your bathing experience. Handcrafted items to enhance your bathing experience and gift giving needs. Natural Soap Bases are used to create our scented soaps. Some of these soaps do have synthetic fragrance oils used in them. 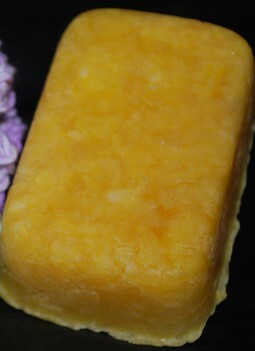 We also produce 100% Natural bars made with the finest essential oils and ingredients. Natural soaps characteristically do not bubble like commercially produced detergents, however our bars all have natural ingredients added to aid in lather and bubble production. Our soaps are super fatted to 8% which ensures that they are extra moisturizing to your skin and feel luxurious when you are using them. 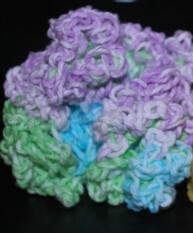 These Scrubbies do shrink slightly and get softer with use. Our Small Scrubbie is made to fit within the palm of your hand, it is great for using on your face or for small children. This Laundry soap is unscented and uncolored. It does not cause bubbles in your washer and is suitable for use in high efficiency machines. This is excellent laundry soap to use if you have sensitive skin or allergies to commercially produced detergents. sold in 3- 4 oz bars. Solid Shampoo bars are great for travelling, With today's security measures while flying you can be assured of having your favorite shampoo with you and not having to find a store and go shopping upon reaching your destination. These bars work differently than commercially produced shampoos, they remove styling products without a problem and help to stimulate new hair growth as well as control dandruff and itchy scalps. Made with Cocoa Butter, Vitamin E and Olive oils they help lock the moisture into your skin. Body Butter is a cream that melts into your skin and nourishes it on contact. They are great for rejuvenating the dry skin from winter . Smooth some on after using our Sugar Scrubs for a wonderful moisturizing experience. Natural Dusting Powders are used to help soften your skin after a shower or bath. They can also be sprinkled in shoes to refresh as needed. 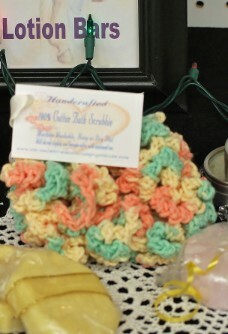 You can use one of our 100% cotton Bath Scrubbies as a powder puff or the attached cotton puff. *The prices on these bars will vary slightly due to bar size 3- 5oz per bar and additional ingredients. 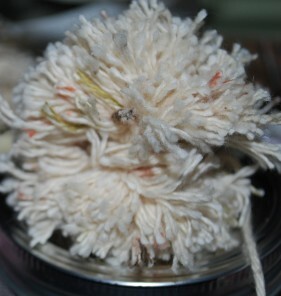 These bouquets are made from 100% cotton Washcloths , the small bouquets have 5 blooms. Large have 10. They are mounted on a plastic stem so that you can display them in whatever fashion you would like. Our Bath Salts and Milk Baths are produced with the finest Sea Salts. Indulge in a milk bath as it enriches your skin and the salt softens the water and allows your skin to absorb more of the nutrients. We have added extra vitamin E to help condition your skin. These fun little cupcakes are not for eating... 3-4 oz bars of soap with a nylon bath scrbbie embedded within the soap make for a great gift and bathing experience. Sugar Scrubs are suitable for use on your face. They help to exfoliate and generate new skin growth as well as gently cleanse your pores. Available in 1 oz bars as well as in a semi liquid form these scrubs are awesome. Body Polishes are not suitable for use in the facial area, the characteristics of these polishes make them too abrasive for the delicate facial pores. These bars ex-foliate and impart natural minerals into your skin,which in turn increases new cell formation and healthier skin. The bars will become more "polished" with use. ** the nature of the ingredients in these bars prohibits them from bubbling when used. We do take special orders and requests.